Those with Trypophobia, look away now. There it is in all its glory, the Nokia 9 PureView - a handset that couldn't be more camera phone if it tried. Just look at that back, which houses a whopping five cameras, a sensor and flash, in an hexagonal shape that's bound to put the fear into those with Trypophobia everywhere. This new image is apparently an official render, found by regular leakers 91Mobiles. The image shows off what other leaks have confirmed before, a camera array that is like no other in the smartphone world. The five lenses are said to contain a high MP main sensor, an ultra-wide lens, depth of field sensor for bokeh loveliness and there could even be a monochrome sensor on board. The phone it's replacing - the Nokia 809 PureView which was launched in 2012 - came with a huge 41MP sensor, f/2.4 Zeiss lens and 4x lossless zoom. These specs are still brilliant for today's phone market so we are expecting something special. Unfortunately this is still speculation at the moment, but we are set to see the Nokia 9 PureView in all its glory at MWC 2019. When it comes to actual specs, it is thought that it will be powered by 6GB of RAM, a Snapdragon 845 CPU and 128GB of internal storage. 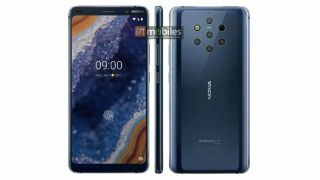 A leaked video back in January also confirmed the look of the Nokia 9 PureView, a device that looks more camera than phone.